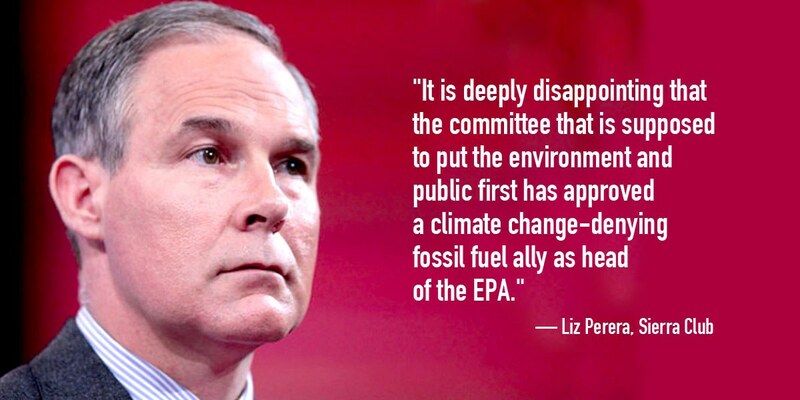 Republicans on the Senate Environment and Public Works Committee have suspended their panel’s rules to force through Scott Pruitt’s nomination to head the U.S. Environmental Protection Agency (EPA). The maneuver was made only one day after all 10 Democratic members of the committee announced a boycott over President Donald Trump’s EPA pick. The boycott was sparked over their serious concerns of the Oklahoma attorney general’s stances on climate change, pollution regulation and unanswered requests to provide official documents or emails that would shed light on his ties to the energy industry. After temporarily suspending the committee’s rules—which requires at least two minority members to meet quorum—committee Republicans unanimously approved Pruitt by a 11-0 vote at a Thursday hearing. This means Pruitt’s nomination will go to the full GOP-controlled Senate, where he is likely to be approved. “I am disappointed that our majority has decided to ignore our concerns and those of the American people, and break the committee’s rules in an effort to expedite Mr. Pruitt’s nomination, but we have to stand our ground in our pursuit of the truth and in fulfillment of our Constitutional duty with respect to nominations,” ranking member Tom Carper (D-DE) said in a statement. “He’s dodged our questions, ignored our letters, and told us go to the back of the line and make open records requests to get the information we are entitled to,” said Sen. Sheldon Whitehouse (D-RI). These actions make very clear what our near term future holds. They will bend or break their own rules and do whatever they will in order to enact their own agenda. There is no representation of citizens interests here. This is the full enactment of corporate agendas and it is their agendas which our federal government now serves. Everything that Environmentalists have strived and stood for since the late 1960s is being undone quicker than would ever have believed possible. This does not make America Great Again, this makes America short-sighted and very foolish.